With Google maps and review websites such as "Yelp!" travelers to the Mississippi Gulf Coast can easily find Great places to eat & hang out. The places listed below are our favorites. They may become yours too. We encourage past guests to share their favorite places with us, so we can let future guests know. Most of these restaurants would need you to call ahead for larger groups. 2 Miles From the Great Escape River House. Capt. Al's has the BEST (Sweetest & Prettiest) Wait Staff on the Coast! Offering everything from lunch specials, Po-Boys, Steaks, Seafood and much more. Its a Local Favorite were locals and local celebrities meet. We can be found At Capt. Al's as often as 4 or 5 times a week. This place has great people and awesome food.... what else could ya want? from the Great Escape River House. Blow Fly Inn Offers great water view while dining inside and out - Casual. Also has a small bar. We'll grab a lunch at the Blow Fly Inn, a few times a month. Like Soup? Try their She Crab Bisque. They also have awesome Honey Mustard dressing. Its made from scratch. While the 2 restaurants above (Blow Fly Inn & Back Bay Seafood) are more our daylight places to eat, THE DOCK is our place to boat to for a place to eat, enjoy some live music and hang-out with friends - in the Summer. For us, we never know who we'll meet up with over at the DOCK, but chances are we'll run into more than a few friends here. They have large outdoor areas to hang out. Often have live music. Have an Oyster Bar. The staff is friendly and the Dock offer both a very casual atmosphere and a fine dining restaurant. During the cooler months its also a fun spot to meet, mingle and eat. For us, its more appetizers and drinks, but they offer a full menu. 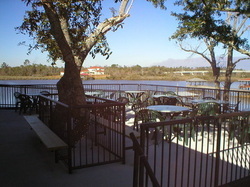 We recommend Half Shell Oyster House (also in Gulfport), Shaggy's and McElroy's (at the Marina behind Hardrock Casino). Many of the Casinos also have some really good restaurants too. The EO Club II & Kelly's Irish Pub (also has a grill). The downtown area of Gulfport has other Bars close to these two that offer a good, safe fun time. Most within easy walking distance of each other. Many have live music. CAPTAIN AL'S -s the closest restaurant to the Great Escape River House. They specialize in Steaks & Seafood. They have Lunch and Dinner Specials. Chain Restaurants like TGI FRIDAYS, LONG HORN STEAKHOUSE, CRACKER BARREL, LOGAN'S STEAK HOUSE, O'CHARLIE'S, can all be found just North of I-10 at the Hwy 49 exit. If you have a craving for Chili's I'd pass on the one in Gulfport, there is one in the D'Iberville area, just North of I-10, that the service and food quality is much better. Well worth the trip. "Yelp!" reviews also show a marked difference in between these 2 locations. 2 of our favorites are DAFFY'S ON THE RIVER & ORANGUTANG'S DAIQUIRIS & BAR both right on the Biloxi River, the Biloxi side of the River. In September 2013 the Lorraine Road bridge that crosses the Biloxi River, making these 2 places easily accessible, was closed. Permanently or Temporarily? That is the question our local newspaper, TV news, and just about everyone on either side of the bridge wants to know. If the bridge isn't opened, you'll need a good GPS system to find your way to these popular hang-outs . . . and just about bread crumbs to find your way back the River House. So, how do we get there? By boat and we're usually picking up a few friends on the way down the river to these hangouts and beyond. The Palace Casino, IP Casino, & Beau Rivage Casino's have buffets that seem to go on for miles. Lots of choices and always good. If you go to Gulfport's only casino, Island View, the Buffet makes an awesome French Vanilla Cappuccino. You have to ask your server for it. I'm always hearing good things about Treasure Bay Casino's Buffet...but haven't been there in years. Every year the Mississippi Gulf Coast hosts "The Covey Awards" of which several businesses in the area sponsor this event and the nominees and winners are voted on by the readers of the Coast Observer. We hope you found the above information helpful. Your comments and suggestions are always Welcome!